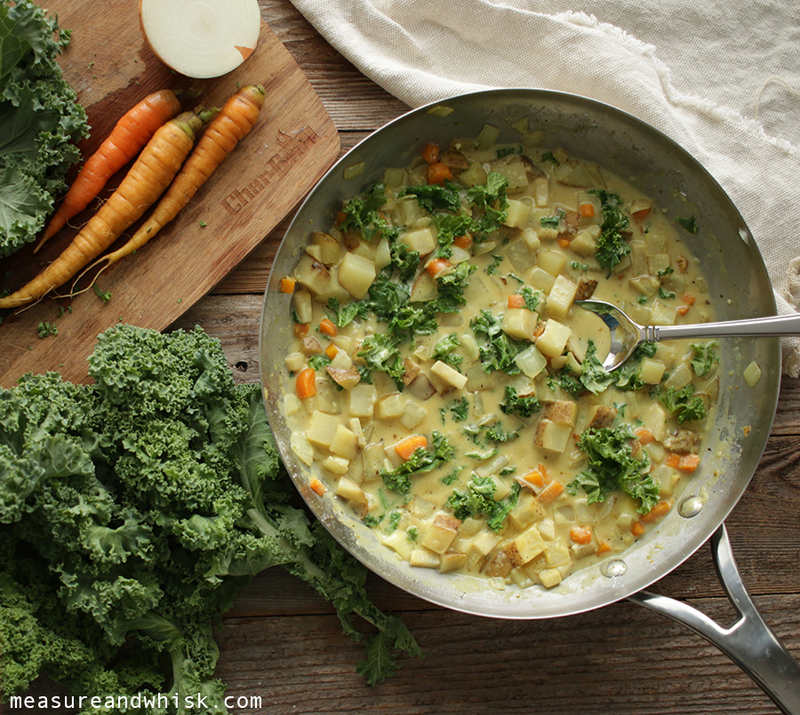 We have been raking in the fall vegetables with our CSA box the last few weeks! Tons of greens, turnips, and carrots. I remember hearing somewhere (honestly, probably "The Great British Bake Show") that "If it grows together, it goes together." Cheesy, but true. 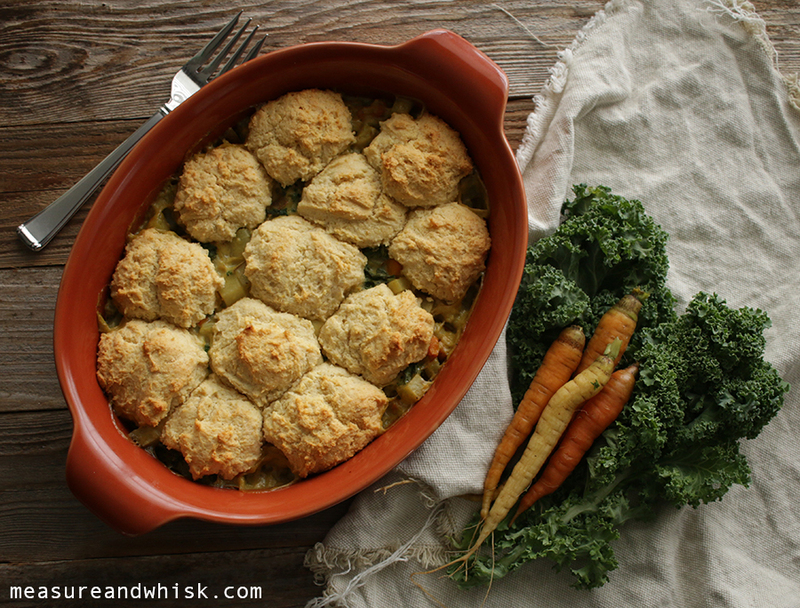 I have long been wanting to create a gorgeous biscuit pot pie, but because of the respect I have for my crust recipe, I just couldn't bring myself to try it out. But with all the root vegetables, it seemed like a crime not to turn them into something warm and delicious like this, so I had to try it out. The first time I made it, there wasn't quite enough sauce (if you look at the photo above, it looks kind of dry, because this was from my first attempt, the next attempts photos just weren't as pretty), but I modified the dish to make loads of the creamiest, most flavorful and lovely sauce you have ever had! It is just the best! Also, Anolon sent me this gorgeous Au Gratin 3-Quart Dish , and it seems like the perfect dish for this gorgeous pie. I just can't get enough of orange in Fall and this dish looked so amazing on my table when I served this for dinner the other night. I felt like a true hostess, even if it was just my family that was eating out of it. Make the biscuits buy combine the flour, cornmeal, baking powder and salt in a stand mixer. Mix for 10 or so seconds until it is combined. Then add the honey and butter pieces and mix for 2 or so minutes, until the butter has broken down into pea sized pieces. Then add the buttermilk and mix until just combined. Drop golf-ball sized lumps onto a silicone mat until you have twelve little mound biscuits, and refrigerate for at least half and hour. While the biscuits are refrigerating, melt the butter in a large pan and preheat your oven to 350°F. Add the onions carrots, potatoes, and turnips and cook them, stirring often, until the onions are translucent. Add the curry, and garlic and stir for 30 seconds or so. Add 1-2 Tbs of water if you need it, to prevent the spices from sticking to the pan. Add the marjoram, turmeric and pepper, then add the flour, and stir until it coats the vegetables. Pour in the water, and then slowly add the milk, stirring while you add it. Add the salt, then bring the mixture to a boil. Turn down the heat to medium, and let it simmer for 10 minutes or so until the potatoes are decently soft. 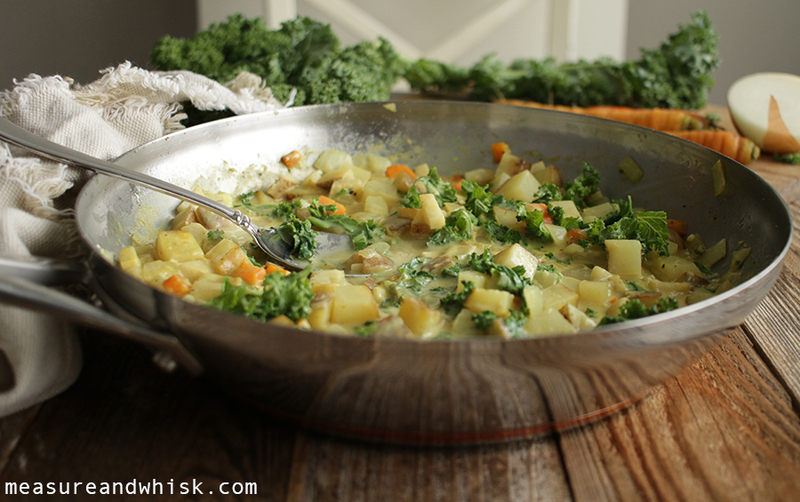 Add the kale, stir for another minute, then pour the entire mixture into a Au Gratin 3-Qt Dish . Remove the chilled biscuits from the fridge, and carefully place them on top of the liquid mixture. Place the entire Au Gratin dish in the oven and cook for 35-45 minutes, until the biscuits are golden brown. Remove from the oven, let cool for 5 minutes, then serve. Enjoy! 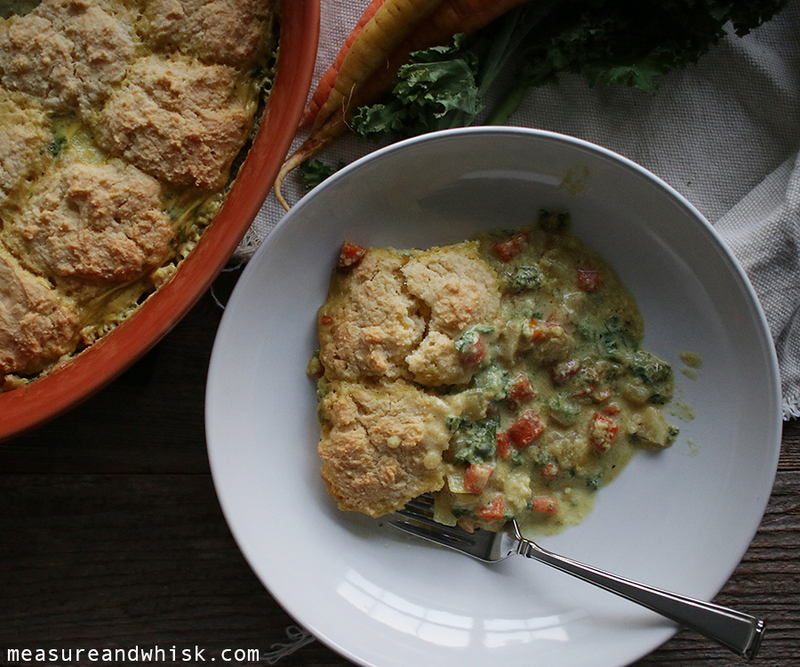 Hooray a vegetarian pot pie recipe!!! Excited to try it! I made this for dinner tonight and it was amazing! My 19 month old daughter even loved it too! Thanks for all the great recipes.